I've just put together Issue 24 of 'A Pinch of Salt'. If you're not subscribed but you'd like to be email me editor.apos[at]gmail.com and I'll send you a copy when it's back from the printers. 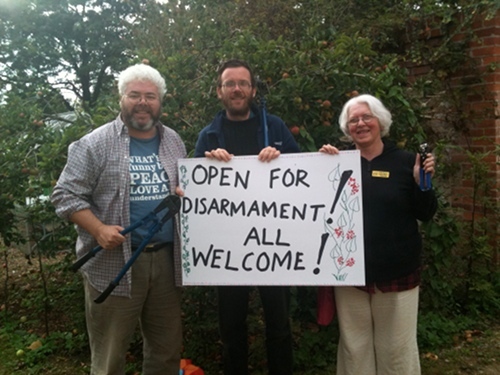 Chris and Martin with Sr Susan disarming AWE Aldermaston. Following the recent announcement that the CPS* are seeking a ten year ban on Chris Cole entering the Westminster area Fr Martin Newell faces the same procedure. Both Martin and Chris have a long history of direct action and public liturgy at places of violence. Both are likely to have ASBOs preventing them from going near to Westminster for ten years. These ASBOs have particular implications because every citizen has a right to address her or his MP in Westminster. Do you know of any similar ASBOs being handed out or attempted by the CPS? St Paul, patron Saint of the Occupy Movement? If you live in or around London there is a workshop on Thursday at 1 pm at the Bank of Ideas you might be interested in. "Would St Paul the Tentmaker have camped with Occupy?" with Juliet Kilpin. Since the movement in Britain has focussed around St Paul's Cathedral, and St Paul was an itinerant awning-maker who challenged the ideology of empire in his day, it's a question worth exploring. Understandably folk are often put off by St Paul's letters, often verbose and sexist, but an increasing number of scholars are separating those early letters from the real Paul with later letters that bear his name. What they're finding is that the original Paul was far more radical than we have given him credit for. If you haven't read it, I'd recommend 'The First Paul' by Crossan and Borg as an accessible and thorough introduction to the radical Jewish mystic who could easily be the patron saint of Occupations. Here's an excerpt from an inspiring New Year message from Dave Andrews. Dave works and lives in Brisbane, Australia. He is part of the 'Waiters Union' there, facilitating and celebrating community. Among other things, he has a particular enthusiasm for respectfully working with people of other faiths. I’ve been preparing to face the New Year by watching An African Answer, a documentary that traces the efforts of Pastor James Wuye and Imam Muhummad Ashafa, in bringing peace after the post-election blood-letting in Kenya’s Rift Valley. Some of the best answers to questions about how we can create peace in the midst of war are being forged in Africa. I first encountered James Wuye and Muhammad Ashafa when The Imam and The Pastor told their story of moving from leading militias killing one another to leading peace-making initiatives in Nigeria. They have visited Australia and they have become a model for the peacemaking initiatives I am taking this year with Nora Amath, a Muslim colleague and close friend. to all people regardless of their faith. · Listen to what others have to say. · Not tell other people what they believe, let them to tell us. · Respect other’s views, even if we disagree with their views. · Be honest and sensitive in what we say. · Speak positively of our faith, not negatively of other’s. · Not try and force people to agree with our own views. · Not judge people by what other people of their faith do. 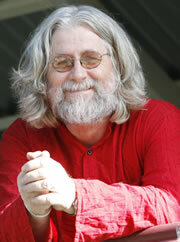 · Acknowledge both similarities and differences between our faiths. · Share our faiths with sincerity, transparency, mercy and compassion. · Be honest, if an event includes sharing our faith. Not bait and switch. · Serve without strings attached. Not exploit the vulnerability of people. · Witness, but not convert. Never try to induce or to coerce a conversion. · Respect the choice of faith others make. Accept them without resentment. · Encourage positive relationships between faith communities. · Encourage constructive relationships with the wider community. · Use our wisdom, knowledge, skills and resources to serve people. · Discuss problems arising face to face so we can solve them peacefully.